Want this item shipped out today, April 22? Order within the next 4 hrs 25 mins. A nice kit but I think DW went a little too far with the soldering. Since all of the wires are soldered together, specifically the power wire that includes the fuse, you have to cut and resolder to get the wire through the fire wall. 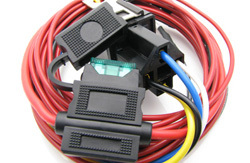 I understand this is a universal kit so the other wires I wasnt too concerned with, but I can't imagine any car having a big enough grommet throught the fire wall to slip either the fuse holder or the relay connector through.